The next time you go to the grocery store, write down the order of how items appear in the aisles. For example, I start on the right-hand side of the store where the produce department is first, and the meat department is second, and so on. Make out your grocery shopping list in the same order. You'll avoid having to go back for something you missed, saving time. An in-order-by-aisle list will make your shopping go much smoother and easier. Serve ice in children's brightly-colored plastic sand pails. The small shovel makes a fun ice scoop, and the pails add to the party decor. to assemble...the kids will love 'em! Two ingredients- 18 homemade or bakery cookies (about 3 inch width), and your favorite flavor ice cream, softened. To soften ice cream let it stand at room temperature for 10-15 minutes. Scoop 1/3 cup ice cream on bottom of a cookie; press down gently with another cookie to make a sandwich. If desired, roll sides of the sandwich in jimmies, chocolate chips, chopped nuts, or coconut. Wrap in plastic wrap. Repeat with other cookies. Freeze until ready to serve. Makes 9 sandwiches. Herb- Add 4 tsp. snipped fresh parsley and 1 tsp. minced fresh basil or tarragon. Parisian- Add 2 tblsp. chopped green pepper, 2 tblsp. chopped celery, 2 tsp. chopped onion, 1/2 tsp. Worcestershire sauce and 1/2 tsp. salt. Cheese- Add 2 to 4 tblsp. crumbled blue or Roquefort cheese. Spicy Red- Add 1/3 cup ketchup, 1 tsp. chopped onion, 1 tsp. Worcestershire sauce and 2 tblsp. chopped sweet pickle. Pimiento- Add 4 tsp. minced pimiento, 4 tsp. minced fresh parsley and 1 finely chopped hard-cooked egg. Decorating Easter Cupcakes-To decorate Easter cupcakes fill a decorating bag or a resealable plastic bag with one tablespoon each of frosting in different colors. 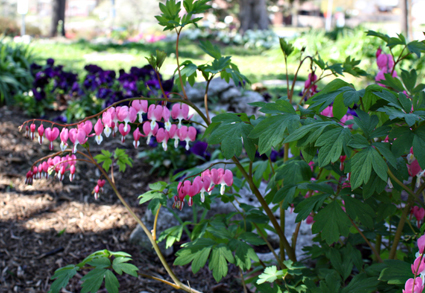 Pink and green is a pretty color combination. When you squeeze out the frosting you'll have colorful rainbow swirls! Oven Racks- High or low...where do they go? Position oven racks as close to the center of the oven as possible. The top of your baking pan should be at the center of the oven when placed on the rack. For example, a tall tube pan should be placed in the lower third of the oven. If you are using two racks at the same time, stagger the pans allowing a minimum of two inches between the pans and sides of the oven for sufficient air flow. tree-lined shopping district that is all antiques, vintage, and collectibles. It's my favorite place to have lunch and vintage shop. 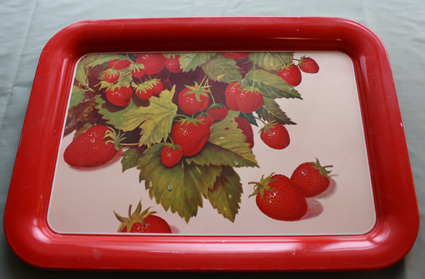 A large metal strawberry tray. I love the strawberry graphic- now to find a place to hang it! Depression glass, green Block Optic pattern sherbet glasses from the 1930s. I'll be serving ice cream in these. A vintage dish towel. 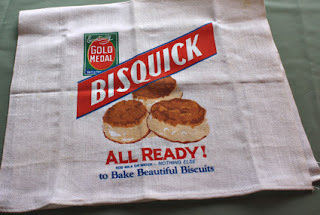 I love the vintage logo and biscuits on it. Sometimes called candied carrots and just like grandma used to make. 1/4 cup packed brown sugar; 1/4 teaspoon salt. Put carrots in a large saucepan. Add 1 inch of water. Bring to a boil. Reduce heat; cover and simmer for 8-10 minutes until crisp-tender. Drain carrots and set aside. In the same pan combine the butter, brown sugar, and salt. Cook on medium-low heat; stirring constantly until the butter is melted. Add the cooked carrots. Stir all together and cook over medium heat, stirring constantly until carrots are evenly glazed- about 5 minutes. Serves 8. Food Coupons- Save money with free coupons you can print! Coupons in the middle are from my printer. 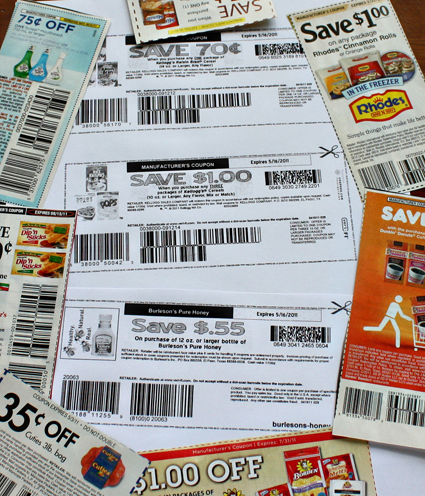 Most everyone is familiar with grocery coupons. They come in the Sunday paper every week but did you know you can print coupons from your printer? These are free coupons from major food manufacturers such as Kraft, Pillsbury, Libby's, among others. Most of the coupons I see are for 50 cents or more. I also see a lot of high-value one dollar coupons. You can't beat saving a whole buck! Three of my favorite coupon sites are Coupons.com, SmartSource, and RedPlum. 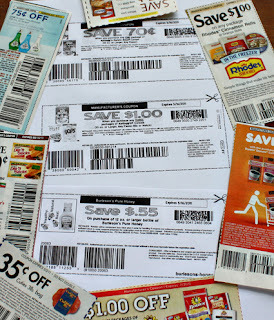 You can print out tons of online printable coupons absolutely free at these sites. The coupons you choose will print out with barcodes. The barcodes on the coupon will be scanned at the register by the grocery cashier, giving you the discount. To learn more about printable coupons visit Sarah Roe's site- moneysavingqueen.com. Sarah is the "guru" of couponing and her site is packed full of great info. Store eggs in the fridge covered, in the carton they came in. Why? Eggs have a porous shell. Storing them covered helps prevent moisture loss and helps keep them from absorbing fridge odors. Store eggs in the coldest part of the fridge- on a shelf toward the back. Out of sour cream? Plain yogurt can be substituted for sour cream in equal amounts for baking. It can also be used as a substitute in dips, sauces, and casseroles. Dips and sauces may be slightly thinner when using yogurt. Note: Nonfat yogurt used in a baked recipe will not work well. Meal Ideas- Make more exciting meals with food combos. To provide a contrast in texture, combine crunchy with smooth. A crisp salad with smooth mashed potatoes; for breakfast, crunchy toast with a soft-boiled egg; crunchy corn flakes with slices of smooth banana. To provide a contrast in temperature, combine cold or cool, with hot. Ice cream with hot chocolate sauce; or a cold salad with a sizzling steak. To provide a contrast in color, combine contrasting colors on the plate. A red tomato slice on green lettuce; yellow peaches with green grapes; or chocolate cake with a light-colored icing. To provide a contrast in tastes, combine mild with strong. A mild-tasting baked or fried fish served with the strong taste of lemon juice or tartar sauce. So...one reason a steak dinner is so appealing is the cold salad contrasts with the sizzling hot steak, and the crunchiness of the salad contrasts with the smoothness of the baked potato. Party Cupcakes- Get them to the party in one piece. Taking cupcakes or a frosted cake to a party or gathering? Before covering, coat the plastic wrap with a light layer of nonstick cooking spray. The frosting won't stick and the dessert will arrive in one piece. Boiled eggs- How to center the yolk for prettier deviled eggs. For more attractive deviled eggs with the yolks nicely centered, store eggs in the fridge with the big end pointed up. This will center the yolk in the white. Out of tomato paste? Here's a quick fill-in: For 1 tablespoon of tomato paste, use 3 tablespoons of tomato sauce or tomato puree. Reduce the liquid in the recipe by 3 tablespoons. Another tip: To remove tomato paste from those itty-bitty cans open both ends of the can, then push the paste out the opposite end with a spoon. Easy! Cupcakes- Using paper cupcake liners. When baking cupcakes or muffins in decorative cupcake liners, spray the liners with non-stick cooking spray. They will peel off smoothly, leaving the cupcake in one piece. Fill cupcake liners until they are half full, but no more than two-thirds full. This prevents the batter from spilling over onto the pan. Have you enjoyed herb butters served in fancy restaurants? Herb butters are excellent on just about everything: steaks, chicken, fish, vegetables, warm rolls...here's the recipe. Combine 1 tablespoon of minced fresh herbs and 1/2 cup softened butter. Summer savory, chives, parsley, and crushed garlic cloves work well. Be adventurous! Spoon the mixture onto a piece of buttered wax paper or plastic wrap. Shape into a log and put in the freezer for 1/2 hour so the flavors will mingle. Slice off a round as needed. Decorate a chocolate cake quickly and easily- take a paper doily and place it on top of the cake. Press powdered sugar through a kitchen strainer, sprinkling evenly over the cake. Carefully lift the doily. You'll have a pretty, lacy pattern on top. Soften hard raisins...an easy fix. Have you ever started a recipe to find that your box of raisins had become hard? To soften hard raisins, put them in a plastic bag and then place the bag in warm water for 15 minutes. Check for softness. 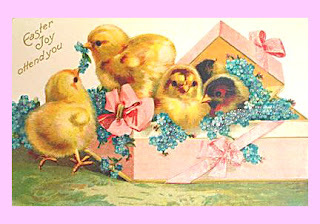 It's almost time for Easter Brunch! Here's an extra-special butter spread that is wonderful on muffins, french toast, pancakes, bagels...all manner of breakfast breads. It takes just 3 ingredients. Honey Cinnamon Butter- 1 cup butter, softened; 1/2 cup honey; and 1 teaspoon ground cinnamon. Beat all ingredients together until smooth. Refrigerate any leftovers. Makes 1 1/3 cups. If your bananas are overripe and you're not in the mood to bake, throw the whole bunch into the freezer for later. They will turn black and will be soft inside when you defrost them, but no worries... that makes 'em easier to use when you decide to make muffins or banana bread. Shaping meatballs the easy way. Your kid's cereal box...a sneaky way to cut the sugar. All kids love sugar-coated cereals. Here's a sneaky way to cut down on the sugar. Buy two kinds of cereal with the same shape, one sugared and one not. Mix them in a large bag and then pour them back into the original box. Examples: Mix Froot Loops and Cheerios; Cocoa Krispies and Rice Krispies; Frosted Flakes and corn flakes, etc. When it's poured into the cereal bowl the kids will hardly notice. The kiddos still get the sweetness they crave and the amount of sugar is cut in half. 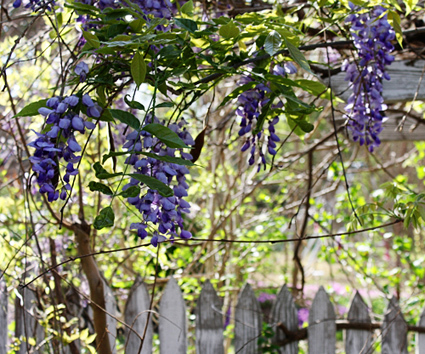 Just a touch of spring! Here's the final post on choosing the best fresh produce at your local produce market, farmers market, or grocery store. Peaches- Peaches should be slightly firm, not bruised. The skin should be yellow or red in color, with color showing over the entire surface. Peas and Lima Beans- Select pods that are well filled but not bulging. Avoid dried, spotted, or yellow pods. Pears- Pears are sometimes sold slightly under ripe and will need to be ripened at home. Pears are ripe when they yield slightly to moderate pressure. Potatoes- The best quality potatoes are firm, smooth and well shaped. Choose those free from cuts, blemishes and decay. Avoid potatoes with large eyes. Potatoes with green skins may taste bitter. Root vegetables- Carrots, radishes, turnips, parsnips- Skin should be smooth and firm. Choose medium in size. Very large carrots may have woody cores. Oversized radishes may be pithy. Oversized turnips, beets, and parsnips may be woody. Sweet Potatoes- Skin should be smooth and firm and free from cuts, blemishes and decay. Depending on the variety skin color will be bronze, rosy, yellow, or light brown. * Use glass measuring cups for liquid ingredients. Read at eye level. * Measuring spoons can be used for both liquid and dry ingredients. Amen. 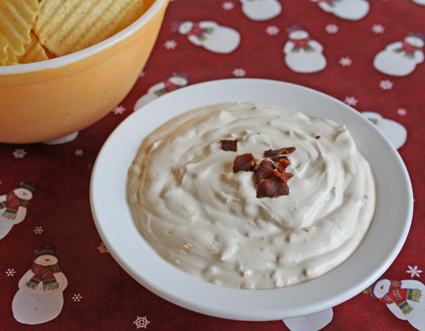 This is my favorite onion dip recipe bar none! Way better than store-bought. 16 oz. container sour cream. Only two ingredients- easy peasy. Blend all ingredients until the dip is an even tan color. Make about 2 cups. I would recommend doubling the recipe because it goes fast! Yummy variation: Add 1/3 cup crumbled cooked bacon or bacon bits to the mix.